Please Be Sure and Demo This Database Before Purchasing a Key code.Â No Returns Once a Key code is Issued. 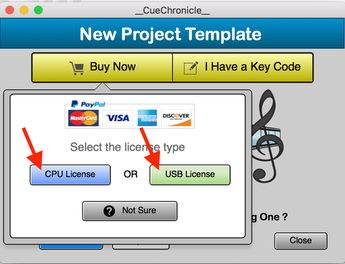 Â **Â As of 2019, if it has been more than a year since you purchased Cue Chronicle and new versions have been made available, there will be a charge to register a new device. Â Â Â Â Â Â Â Â Â Internet Access and Email Application Required to Complete Purchase. Download CueChronicle v5 FS or RT and Install it on your Computer. Â Â Â Â Â Â FS Â Users Open CCStartTemplate v5.fmp12, file path shown below. Â Â Â Â Â Â RT Users Open CCStartTemplate v5.fmp12, file path shown below. Select which device you want to register. CPU - the computer you are currently on. After you select the type of registration, you will be prompted to send out the registration email to CueChronicle headquarters, hit OK. Your interenet browser will open to the PayPal purchase page. 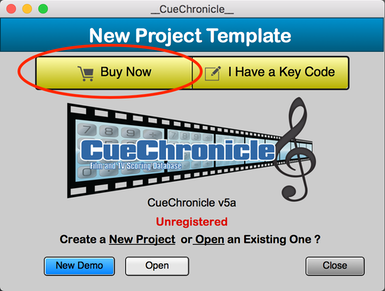 If you are already a CCv4 registered user, click CueChronicle v5 Upgade button. If you are a new user click the v5 New Purchase button. After your PayPal purchase is received an email with your key code and instructions will be sent to you. This is not an automated service, key codes are returned as soon as possible, but it could take up to 24 hours.